This amazing infographic explains why the Subaru Outback is the ultimate adventuremobile. It enumerates several advantages of the car that will convince you buy it. If you love traveling and going further Subaru Outback is most probably the right choice for you. Read this infographic to understand why Subaru Outback should be your next car. The Subaru Outback may be the ultimate adventure truck but it also caters to other needs – whether it is carrying a family of five or traveling under extreme weather conditions. The Outback is equipped with Steering-Responsive Fog lights which provide illumination on the road during extreme weather conditions. A key feature that makes the Outback standout is its AWD system. The Outback Variable Climate Control is not just for the front and second-row passengers, it is also for pets! 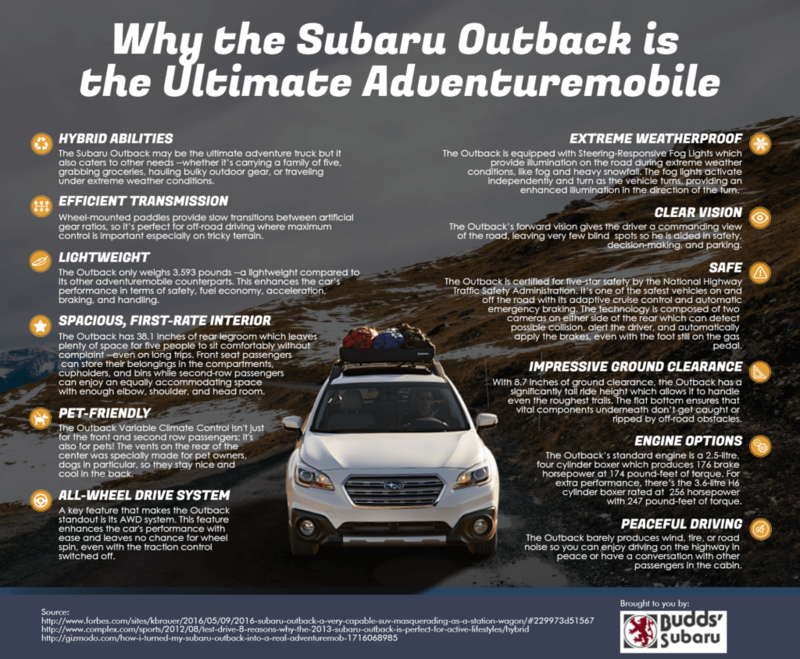 Read the infographic and find out the full list of advantages that Subaru Outback would give you on the road.